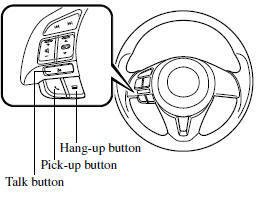 When the audio unit is turned on, operation of the audio unit from the steering wheel is possible. Because the audio unit will be turned off under the following conditions, the switches will be inoperable. • When the ignition is switched off. • When the power button on the audio unit is pressed and the audio unit is turned off. • The talk button, pick-up button, and hangup button are operable with the audio unit turned off. • Mazda has installed this system to prevent distraction while driving the vehicle and using audio controls on the dashboard. Always make safe driving your first priority. stored station in the order that it was stored (1―6). or lower frequency whether programmed or not. forward to the beginning of the next track. mute audio, press it again to resume audio output. If the ignition is switched off with the audio muted, the mute will be canceled. Therefore, when the engine is restarted, the audio is not muted. To mute the audio again, press the mute switch ( ).